When making any major purchase for your business, your choice of a screening equipment manufacturer is critical. This is particularly true of specialized machinery such as industrial sifting machines. Though you know your business and its needs, there’s a good chance you don’t have the technical background required to make a truly informed purchase. When a manufacturer is committed to your success, they can be an important ally throughout the purchase process and beyond. Here’s how you can benefit from being selective in who you work with. Improved productivity. 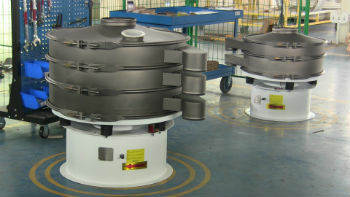 First and most importantly, an industrial sifter must be able to meet your production demands. Choosing a sifting machine from a reliable manufacturer will ensure your operation stays productive, shift after shift. What’s more, a good industrial sifter will be powerful and durable enough to keep serving you reliably as your business grows and your needs change. Less downtime. The other half of the performance equation is reliability. Downtime due to maintenance or emergency repairs can quickly eat into your profitability. A customer-focused manufacturer will engineer their screening machines for longer service intervals and greater reliability overall, so you can keep working for longer. A better finished product. An industrial sifter must be able to do its job well. This means quickly and reliably sifting and sorting your materials with accuracy. Good sifting equipment designed by a reliable manufacturer will be better at maintaining sanitary conditions and reducing the risk of product loss. All these benefits ultimately contribute to the long-term success of your business. But that’s not all a customer-focused industrial sifter manufacturer can bring to the table. Read on to learn more. Even the best industrial sifter isn’t right for every operation. A poor match between machine and task will easily negate all the benefits superior screening and sifting equipment can offer. A manufacturer that’s committed to your success will take the time to assess your requirements and recommend the best machine for the job. For this reason, expertise in various industries, from food and beverage to mining and recycling, is an essential characteristic to look for in a vibrating sifter manufacturer. A focus on enabling customer success should extend well beyond the initial sale. This is as true when buying an industrial sifting machine as it is when buying any other type of equipment. Look for a company with the infrastructure in place to provide long-term support for your purchase, including an extensive inventory of replacement screens and other parts as well as the ability to quickly respond in an emergency and provide maintenance and repairs as necessary. VibraScreener™ is a leading manufacturer of industrial sifting machines and an important partner to customers in a wide range of industries. We offer quality products, expert support and an in-house testing lab for determining with accuracy the best machine and screen type for your needs. If you’re in the market for a new industrial sifter, contact us first.